The complex consists of three separate buildings. 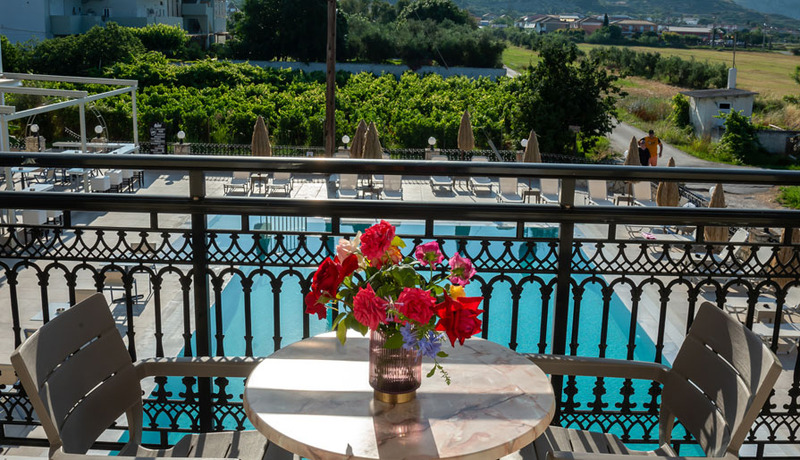 All top floor apartments are situated in the first building overlooking the main Kalamaki-Laganas road. All budget ground floor apartments overlook part of the garden and the neighboring studio building. All studios are situated in the two back buildings overlooking the sea in the background, the garden or the surrounding mountains and fields. 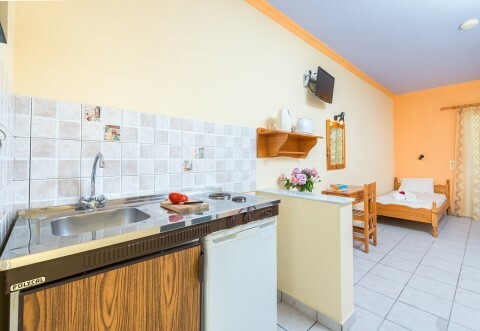 Each studio can accommodate 1-3 people and features three single beds, equipped kitchenette with fridge, toaster, kettle, cooking facilities and utensils, private bathroom with shower, safety deposit box, flat screen satellite TV and furnished balcony or patio. Air conditioning is available on request, at an extra charge. Each top floor apartment is suitable for 2-4 people and features a room with two single beds, equipped kitchenette with 2 electric rings, fridge, toaster, kettle, cooking facilities and utensils, private bathroom with shower and a separate bedroom with a further two single beds. It also includes a flat screen satellite TV in each room, safety deposit box and furnished balcony. Air conditioning is available on request, at an extra charge. All top floor apartments overlook the main Kalamaki-Laganas road. 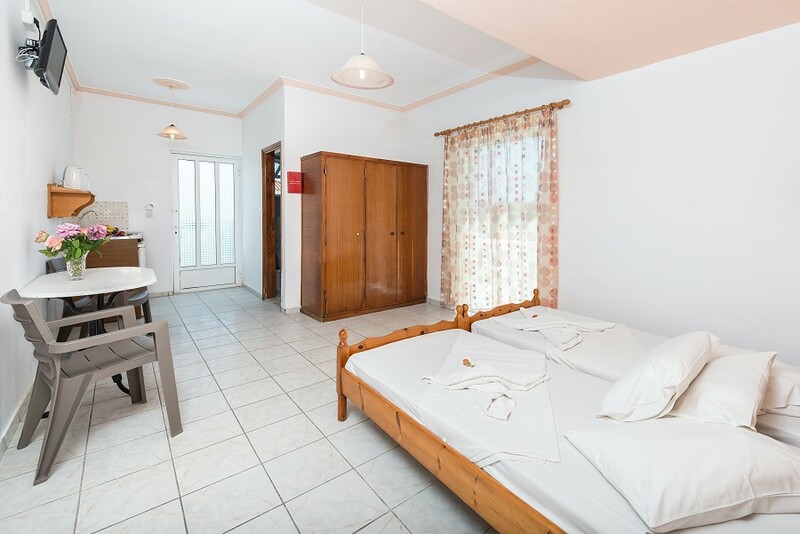 Budget ground floor apartments are ideal for families or groups of friends who explore the island during the day and return to their room in the evening in order to get some rest. They are located in the back of the first building overlooking the garden and the second building. Each apartment is suitable for 2-4 persons. 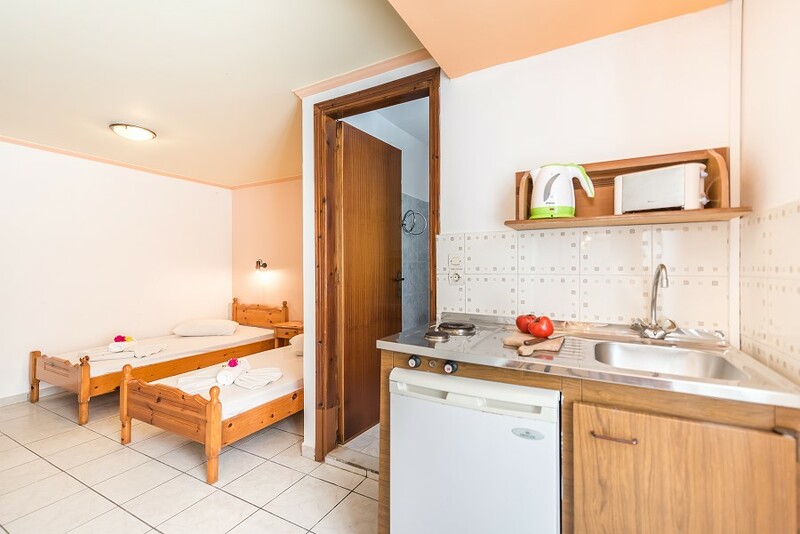 It features a room with two single beds, equipped kitchenette with 2 electric rings, fridge, toaster, kettle, cooking facilities and utensils, private bathroom with shower and a separate bedroom with a further two single beds. It also includes a flat screen satellite TV in each room, safety deposit box and furnished patio. There is a step downwards when entering the apartment. 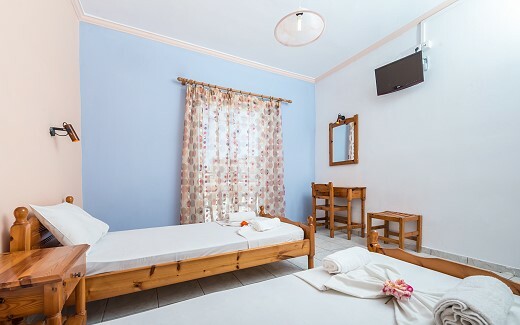 One of the coolest room types at the Athina Apts, it is the right choice for a vacation on a budget. Air conditioning is available on request, at an extra charge. 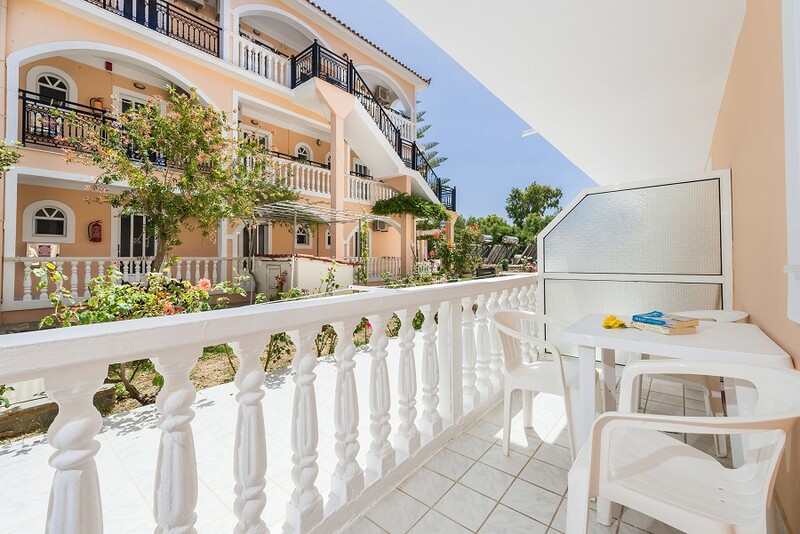 The Athina Studios & Apartments do not have a 24hour reception and therefore guests are advised to inform the accommodation of their arrival time prior to their stay in order to avoid any unnecessary delays. If your arrival is early in the day (before 08:00am) and you prefer immediate access to your room, we recommend reserving for the prior night to guarantee there will be no delays. Similarly, for late departures, reserving an additional night will guarantee your room until you leave the accommodation. If you choose not to reserve, we will be glad to store your luggage for you.